This project was a combination interlocking paving for the patio surfaces & natural stone for all the walls, steps and fire pit. Thus Land art was born. Since 1994 we have worked diligently to stay true to our name. Located in Marriottsville, Maryland we proudly serve in Howard, Carroll, Montgomery, Frederick and Baltimore counties as well as Baltimore City. 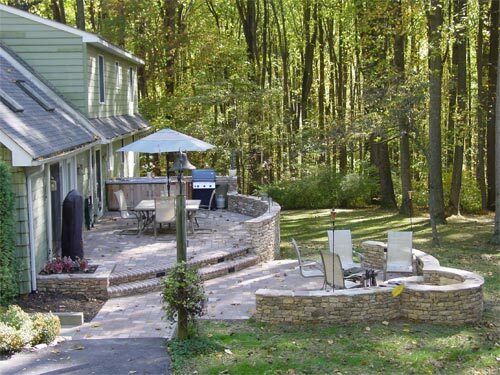 Our wide range of services begin with innovative designs and expert installations of patios, walks, retaining walls, garden structures, landscape lighting, waterfalls, ponds and fountains, outdoor kitchens, outdoor fireplaces and fire pits, as well as horticultural services to meet your maintenance needs. Our goal for our clients is to transform their gardens into masterpieces they can enjoy and cherish.